If you would like to see a wider selection of photos of this trek, and in better resolution than on this site, please take a look at my slideshow posted on YouTube. It lasts a little over 17 minutes, so sit back and enjoy! I have put together a live talk and slideshow presentation of my experiences to offer to interested parties. It takes the audience on a bit of a roller-coaster ride as they accompany me vicariously on this odyssey. It lasts a little over an hour and I am very happy to entertain a 'Question & Answer' session afterwards. If you are interested in hosting such a presentation, please contact me. One of my presentations was recorded at the Ilsley Public Library in Middlebury, VT, in association with Middlebury Community Television, and can be seen online. The videography does not always focus on the best subject, but it is sufficient to gain a good idea of what to expect. Stephen Watson of WPTZ (News Channel 5) showed an interest in my story as part of a mission to feature local athletes in his sports segment. Shortly before my departure he met me at Vergennes Basin to film a "before" interview, and following my return he managed to squeeze a few minutes into a busy schedule to have a chat in the WPTZ offices in Colchester VT and film some footage for his weekend broadcast. 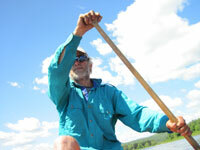 Mike Lynch, also a through-paddler, met me at Saranac Lake as I passed through on Day 3, and recorded an interview. He followed this up with a telephone interview after I completed the Trail, and these communications, together with information from this website, formed the basis of his article in the Adirondack Daily Enterprise. Phyl Newbeck, writer for Vermont Sports, made contact after attending my slideshow presentation at Outdoor Gear Exchange in Burlington VT. Her article, which also features through-paddler Sam Brakeley, was published in Vermont Sports, August 2014. Zach Despart of the Addison Independent leaned on Phyl Newbeck's article, and added some information gleaned from an interview in the summer of 2014. His article was published in the Addison Independent, online on 22nd August and in print on 25th August 2014. As is true in many press articles, some factual inaccuracies have slipped into some of these. The correct details can be found in this website. I am not excused from this accusation of factual inaccuracy: in my talk and slideshow at the Ilsley Library, Middlebury, referenced above, I at one point confused Churchill with Chamberlain Lake - you'd expect a Brit to know his Prime Ministers rather better!